These September festivals can also pay dividends afterwards, and on tour from Ireland are some exceptional musicians who also grade A for their enhanced educational value. 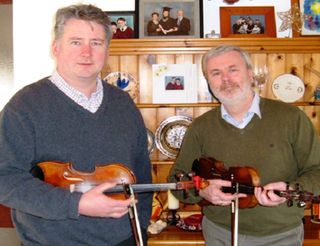 Traveling under the name Fiddle Cases are two hard-core Donegal fiddlers in Caoimhin MacAoidh and Peter Campbell, who will be channeling the music of the Dohertys, Byrnes and Cassidys like you were in a Donegal kitchen session. Both are deeply involved in preservation and promotion of that style of fiddling which you can learn more about while they are touring the East Coast or just enjoy their double fiddle music. Caoimhin has been a scholar in this field for years at Glencolumcille, and Peter is part of the legendary Campbell Family of Glenties. On Saturday, September 15, they will be at a Redden, Connecticut house concert (www.shamrockirishmusic.org) and on Wednesday, September 19 they will guest at Dunne’s session in White Plains (7:30-10:30 p.m.) with Brian Conway. On Friday, September 21 they appear at the John Barry Irish Center in Philadelphia and on September 22 they are at the O’Neill-Malcom CCE Festival in Fairfax, Virginia during the day. They finish up in concert at West Chester University in West Chester, Pennsylvania. One of the most creative singers Ireland has ever produced in either the ballad or literary form is Sean Tyrell, who has found inspiration and creativity among the fertile rocks of the Burren in North Clare for a number of years. On a brief tour to promote a new CD The Walker of the Snow Tyrell pays a visit to Sacred Heart University in Fairfield, Connecticut on Wednesday, September 19 in their Shine Auditorium (contact Dr. Gerry Reid at phone 203-371-7765 or Reidg@sacredheart.edu). He is also the opening act for the fall Blarney Star concert series at Glucksman Ireland House on Friday, September 21 (phone 212-998-3950 or blarneystar.com) starting at 9 p.m.
On Saturday, September 22 he performs at the Monmouth University Center for the Arts at 7:30 p.m. in the Jersey Shore area and on September 27 in Pius X Hall at Manhattanville College in Purchase, New York. He closes out the tour with an appearance at the intimate An Beal Bocht café in Riverdale in the West Bronx on September 29 at 8 p.m. Visit www.seantyrell.com for more info.